A few Saturdays ago the paint-out group was at Arroyo Seco Stables. I was there recently with another group and painted from the horse trail on one side of some of the stalls which I posted in The Stables. The stables are located at the north entrance to the Arroyo Seco Bike Path. At that point a cyclist, or dog walker, or painter can walk down into the Arroyo Seco Flood Control Channel. There was a small tree providing some shade for painting, so I found my spot. There is very little water in the channel now. But to choose the view to the north and a large bridge, or the view south of the smaller, distant overpass? I chose the view south since cyclists and walkers were coming and going from that direction so I thought I could add some figures. I'll have to try some bikes next time! I need to post a watercolor instead of a gouache but I have this gouache piece ready, so here it goes. 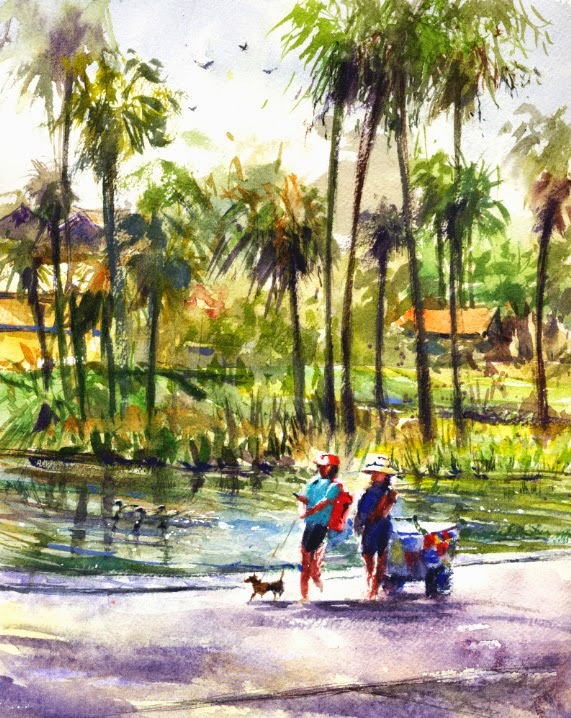 The paint-out group that meets quarterly to plan our locations was back at the Los Angeles County Arboretum in June. 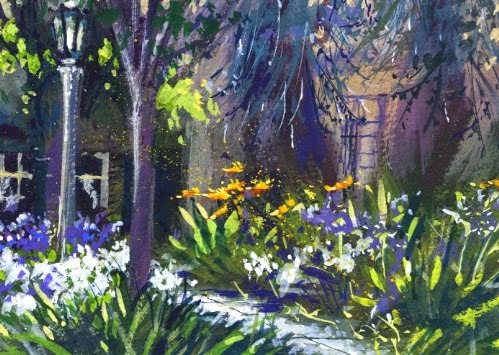 My last post about an Arboretum painting was Yellow Trumpets! Our meeting takes awhile so painting time is a little short. I had a greenhouse in mind for my painting but then when I looked at it again, it didn't appeal that day. 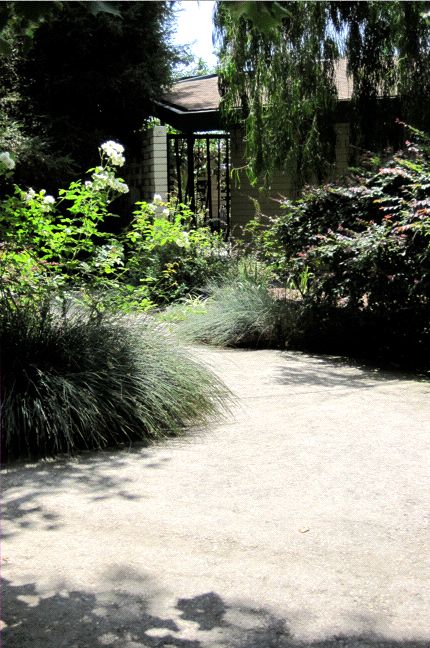 Running out of time, I visited the area of "Garden Vignettes" and chose the Mediation Garden. 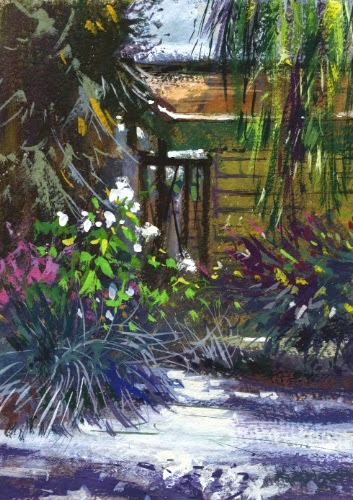 It was shady and I liked the variation of plants, white roses and a willow tree. A peacock was also hanging around there which is so much fun to see. A peahen and her chicks on a walkway near the cafe were certainly used to people. I really need to add one to a painting sometime! Recently I was painting at the City of Pasadena's Central Library. It's a beautiful spot to visit. Built in the 1920's by noted Southern California architect Myron Hunt, it's a landmark building. The day our paint-out group was there, the gorgeous blue and white Agapanthus, Lilies of the Nile, were blooming along a walkway. They were so pretty, I had to give them a try. And there was a bench to paint from in the shade! In the same planters there were some Bird of Paradise plants to add some background orange highlights. It was a warm day and some painters went inside to do some drawing. I might try that on my next visit. I've got quite a few paintings to post and am jumping out of order to add this gouache piece from Saturday. We had fun painting in downtown Los Angeles at Union Station and I like the way this turned out. 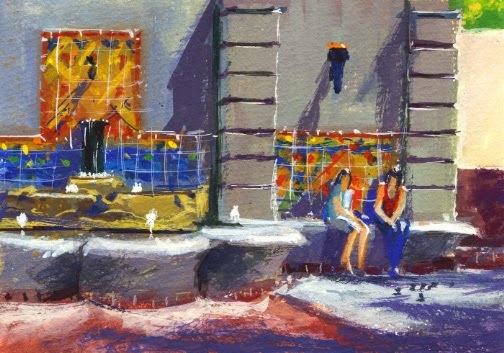 The last time I painted there was over a year ago and posted that watercolor in Union Station Courtyard. Union Station opened in 1939 and has such an exciting vintage feel, like stepping back in time. The north courtyard where I painted last time drew me in again. It's cool, shady, and features a fabulous California tile fountain. I decided to take on the fountain because a couple women sat there to have lunch and feed the small birds. Of course they left by the time I wanted to add them to my painting. I'm so happy for digital cameras! Two tour groups came through while I was painting and I was listening for the name of the California pottery that did the tiles, but no info on that. They did say the north courtyard was meant to be a place for travelers to relax. Looking forward to next time as always! 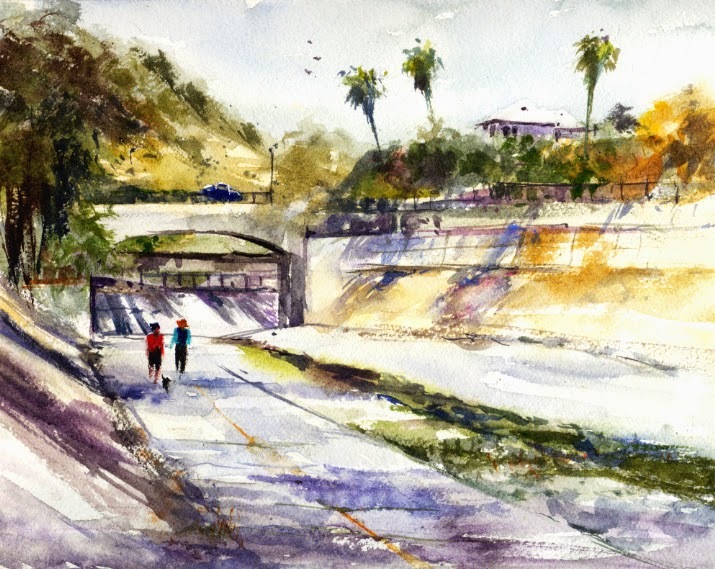 Last month our Saturday plein air group met to paint at Echo Park. Paint-outs there have been increasing since it's lotus season. On my previous visit, an overcast day, I painted a gouache piece of the boathouse which I posted in The Boathouse. Another group has this location on the schedule for next week and I see I need to catch up on posts. It was a busy Saturday at the park. Photographers were getting shots of the gorgeous lotuses. There was a wedding party too. The many paleta carts caught my eye again so I gave it a try. They circulate, or park in the shade, and sell ice cream, popsicles, and fruit bars. This piece was fun, and I had a wonderful morning painting at the lake with friends. 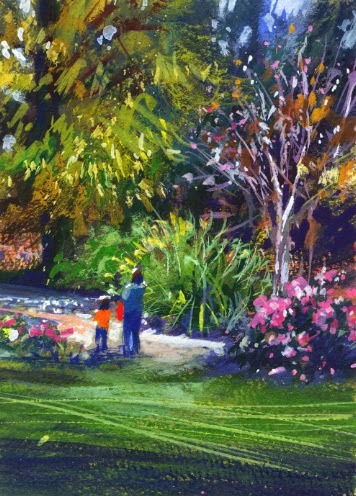 One of the paint-out groups was back at Descanso Gardens in La Canada-Flintridge recently. We like to meet there often because there are so many great views to paint. I see this will be my seventh post about the gardens. My previous visit in March was to paint the tulips, which I posted in The Tulips! That was a gouache piece and I spent so long walking around on my most recent visit, I decided to do a gouache again since I paint those at a smaller size. The roses were blooming and I probably should have tried something different, some flowers, instead of a landscape. Will have to consider that for next time. As usual there were many school kids on field trips as well as families visiting. It's always a busy place. It was almost two years ago that we painted at a nursery in Pasadena. I posted that watercolor in The Nursery! I mentioned I love taking photos at nurseries. One nursery in South Pasadena, Barrister's, has been a great place for some photos. They've always got lots of beautiful pots and garden statues, as well as unusual plants. I never thought I'd be doing a painting at this location. But recently a paint-out group was meeting in the area and several painters were set-up to paint one of the entrances to the nursery. Well, there was shade and friends to chat with so I decided to choose that view too. With such a busy scene - umbrellas, pots, a rack full of summer hats, sculptures, and plants - I decided to try a gouache piece. There were even a couple telephone poles, which I really like to include. This was a fun piece! 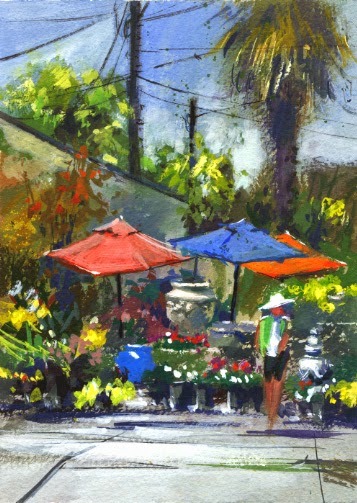 A few Saturdays ago the plein air group painted in Garfield Park in South Pasadena, California. 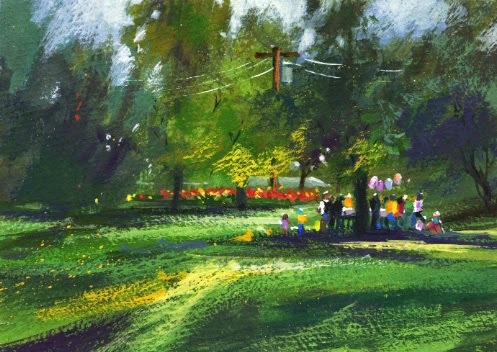 I've lived here in South Pasadena for many years so I was looking forward to painting in the city's main park. It was a very busy day at the park with many dog walkers, groups, parties, and meetings, as well as a few painters. I chose a shady spot under a tree with a view of a birthday party being set up. The balloons caught my eye which I thought would work well in a gouache piece. Lots of green in this one! 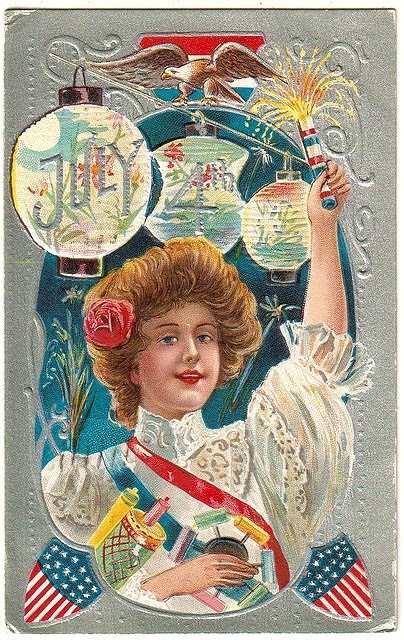 Tomorrow is the Fourth of July and Garfield Park will be even busier. South Pasadena prides itself on having a small town feel. So every year on the Fourth of July the festivities start with a pancake breakfast at 7AM. Then there is a parade with lots of local color which ends at Garfield Park with kids' activities and food. At night we have a terrific fireworks show at the high school. Spectacular!